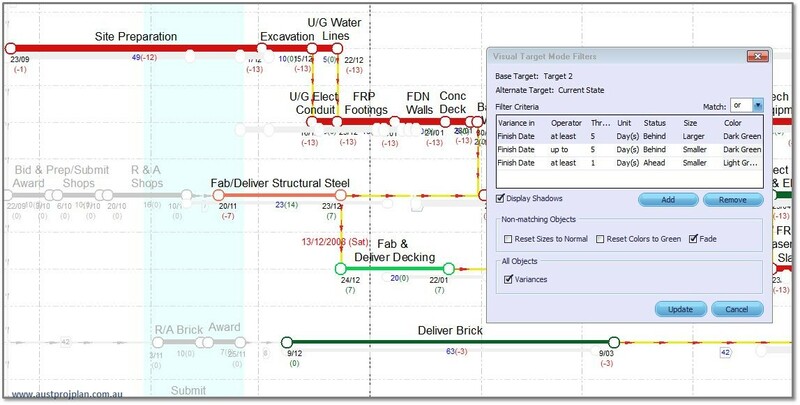 For those not familiar with Netpoint or the Graphical Path Method, refer to more information on the Australasian Project Planning website here, or go direct to the source of all Netpoint and GPM information at PMA Technologies. Back in October 2014, I started a LinkedIn Group for Netpoint users and made a post of enhancement suggestions for Netpoint. Unbeknownst to me, the PMA technologies team were well into making the next major release of Netpoint. At the Netpoint & GPM Conference in January 2015, the features of Netpoint 5 were presented, and now having had a chance to trial a Beta release of Netpoint 5, I’ve put together the following article reviewing some of the main new features to help those who may be moving from earlier releases – or those who may need just a little nudge to try Netpoint for their organisations or projects. As can be expected, there are some limitations of this review, Netpoint 5 is still in Beta release, no doubt there will be further modifications before a final release. Also, Netrisk was not a part of this Beta Trial, so some of the enhancements to NetRisk are not reviewed. 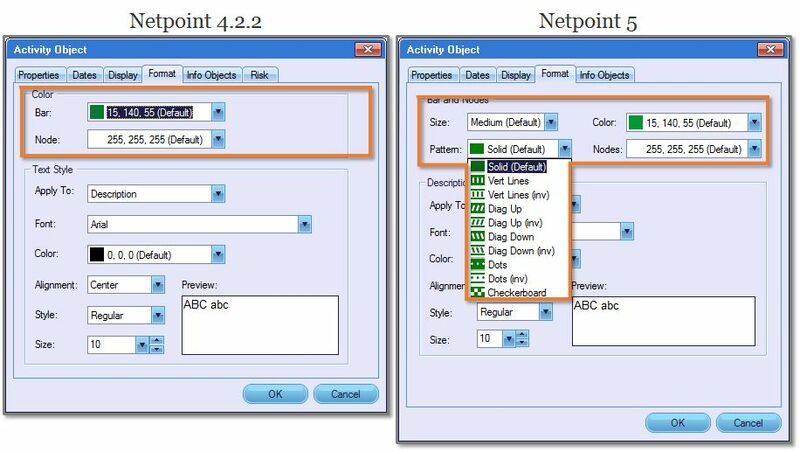 Netpoint 5 now allows setting of sizes and patterns for activities. Activities can now have three different sizes, and hammocks have two additional fill patterns. When used in combination with colours, you now have virtually an unlimited combination of activity bar styles to emphasise (or minimise) a particular sequence of activities against the whole network. For example, while the critical path may show in red, you may want to highlight near-critical paths using thicker orange activities. In earlier releases, critical activities would by default be shown as red bars, but now that custom colouring and patterns to activities can be applied, you can retain these customisations, and still view critical activities, by having their end nodes highlighted as critical. 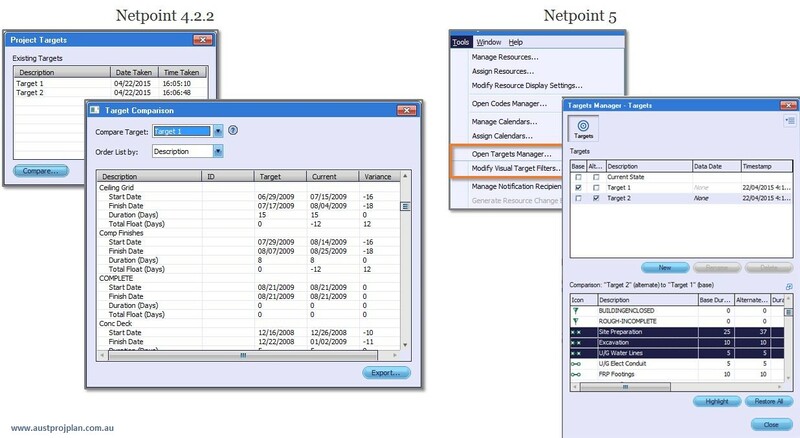 Significant improvements have been made in the way Netpoint uses Targets. Targets are snapshots of the schedule taken at any time, setting the durations and dates for activities to allow for comparison against other targets, or the current schedule. If you need baseline comparisons, progress update comparisons, or scenario “what-if” analysis, you’ll make good use of the Target Manager. 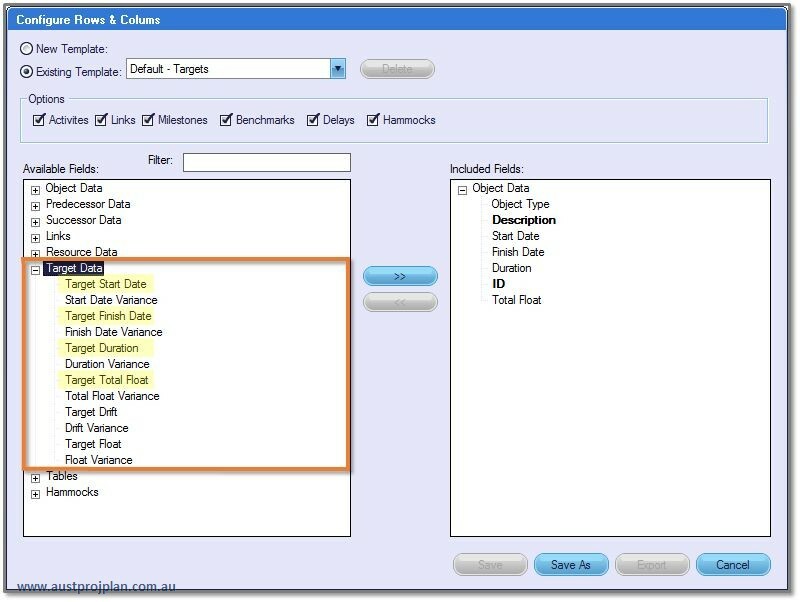 Targets can also be generated every time a data date is drawn and added to the schedule. Visual Target Mode, a new feature of Netpoint 5, lets Target dates be viewed and compared against one another, visually, on the canvas. Think baseline comparison bars, but you can nominate which is the Base Target and which is the Alternate Target from the Target Manager. 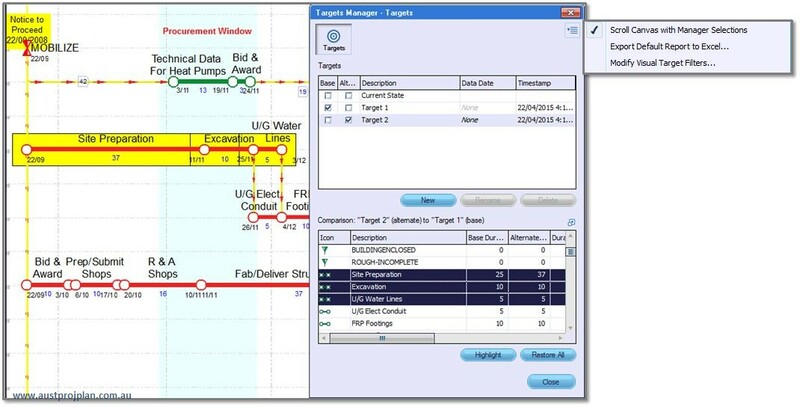 Visual Target mode also allows display formating to be determined based on Variance calculations between the Targets, on the image below, activities that have not shifted from their Base Target have been faded, providing emphasis on those that have changed durations, or finishing earlier or later than the Base Target. Whats best about the Visual Target Mode? target filters will continue to be applied in real-time such that you can see which activities meet the specified conditions as you work on your schedule. If Target comparison in Excel is your thing, Netpoint 5 now produces additional Target values in Excel exports, as shown in the screenshot below (highlighted fields were available in Netpoint 4.2.2). The excel file produced now has a tab for each target stored in the Target Manager against the current schedule. 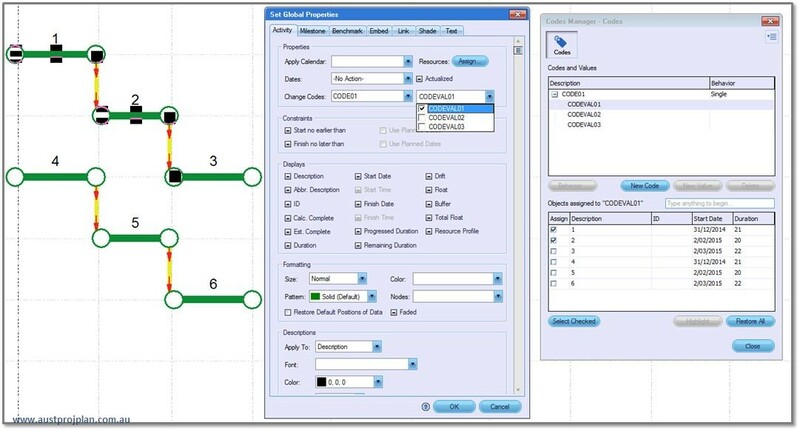 You can rearrange the order of the WBS that is presented, and customise the colours – remember P6 does an alpha-sort on WBS ID’s so they may not be the order you want to present them. 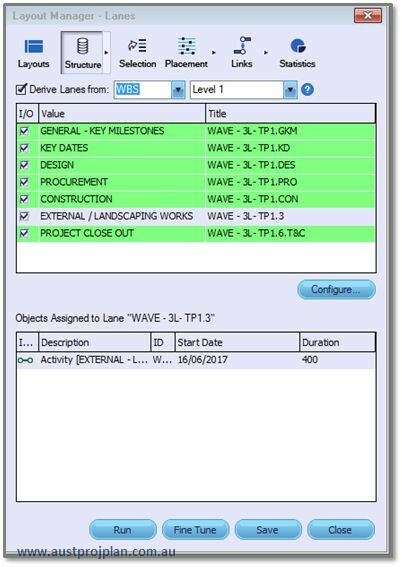 Netpoint 5 lets you generate codes as you work on the canvas, even highlighting activities that have selected codevalues applied to them. 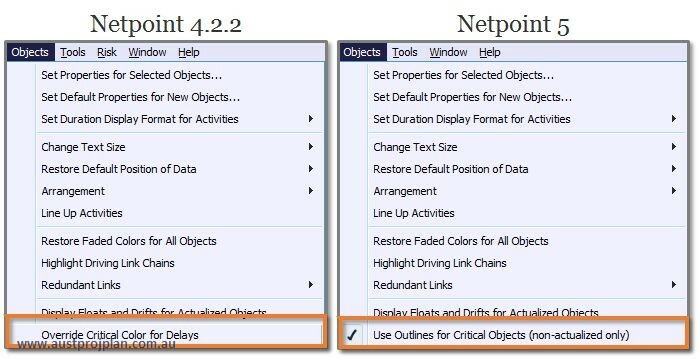 Netpoint 5 now also lets you populate multiple activities using the “select properties for selected objects” as shown above. ALT + mouse cursor to pan around the canvas. There are many other features, improvements and changes from 4.2.2, I suspect as the Beta testing progresses, we’ll find out more, make sure you read the release notes iin any installation to find out what are the features included. Overall, I’m very impressed and happy with the features presented in Netpoint 5, the new features continue to enable Netpoint be a intuitive and visually appealing Planning Tool, and further push the focus on being about understanding what the schedule means, rather than needing to understand how the tool functions. Good job PMA.